Middlesex University's reputation as a global hub for human rights advocacy and thinking has been underscored by a string of high profile achievements made by senior academics in the School of Law in recent weeks. These began at the end of November when the School's dean, Professor Joshua Castellino (pictured second from right), chaired the eight session of the UN Forum on Minority Issues held at the Palais des Nations in Geneva, Switzerland, attended by representatives of 195 states. 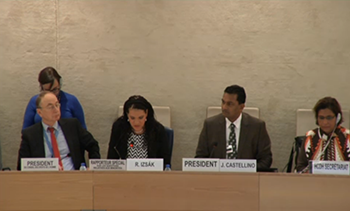 Streamed live on UN Web TV, participants including the Special Rapporteur on Minority Issues Rita Izsák spoke on the topic of 'Minorities in the Criminal Justice System'. Attendees listened to powerful individual testimony from a woman abducted by ISIL forces, as well as the first Roma police officer to address the United Nations. The outcome of the two-day event was a series of recommendations for a more inclusive criminal rights system, which will be finalised in December and adopted by the UN Human Rights Council in March next year. They will assist in establishing benchmarks for how the criminal justice system should operate internationally. "The recommendations of the Forum will make a significant contribution to ensuring a more coherent use of criminal justice systems in tackling wider causes of insecurity, including the threat of terrorism," says Professor Castellino. Students at Middlesex will also benefit, with Professor Castellino set to use the testimonies he heard at the Forum in his teaching. "They will help frame discussions and courses in a greater international setting," he explains. "This is fundamental to modern education in a cosmopolitan city like London." Following Professor Castellino's success in Geneva, the European Human Rights Advocacy Centre (EHRAC) based at Middlesex enjoyed a significant breakthrough of its own when, in a ground-breaking Grand Chamber judgment, the European Court of Human Rights found that Russian legislation on surveillance of mobile telephones is in breach of Article 8 of the European Convention on Human Rights. 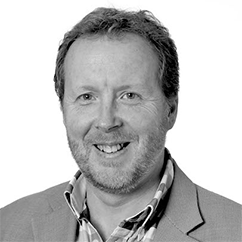 EHRAC Director Professor Philip Leach (pictured above), who represented the applicant in the case, journalist Roman Zakharov, said that "the Russian law will now have to be radically overhauled". The judgment could also impact upon the UK government's plans to implement the Investigatory Powers Bill, some of the provisions of which mirror current practices under Russian law. A draft of the Bill is currently being reviewed. 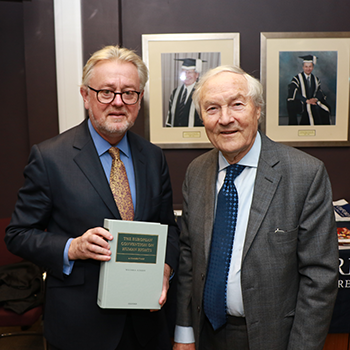 Another expert on the Convention is Professor William Schabas (pictured left with Colin Nicholls QC), who this month launched his new book The European Convention on Human Rights at Middlesex University. The event was attended by Sir Nicolas Bratza, the former president of the European Court of Human Rights, who told the audience that the tome, which provides a detailed review of more than 1,000 judgments and decisions of the Court, is "one of the finest published works on the Convention". "I congratulate Professor Schabas very warmly for a work which will, I predict, swiftly become not only a leading work on the Convention system but an indispensable resource for all interested in what he calls 'one of the great stories of success' in the modern protection of human rights." Middlesex's Deputy Vice-Chancellor (Academic) Professor Waqar Ahmad also applauded Professor Schabas for his "major achievement". "The book is a fitting testament to his expertise in the field of human rights, and represents the depth and quality of research at Middlesex University."